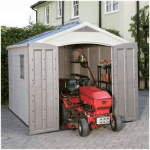 This large yet good looking plastic shed is ideal for people who need a good sized storage facility in their garden that they can erect and then forget about. Despite being made of PVC it has a traditional look, and so won’t seem obtrusive in a garden environment. Thanks to its size it can also be used as a workshop for leisure or work purposes, and because the plastic is fire retardant it could even be used to house motor vehicles. If you’ve only had timber or metal sheds before, then you may be surprised at the advantages that a PVC garden building can bring. They don’t need painting or treating, thus saving the customer both time and money, they don’t rot, split, or warp, and they don’t rust. 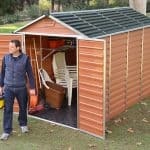 In short, they make very durable sheds and this is a great example. The apex roof at the summit adds extra height to what is already quite a tall structure, and, along with the overlap style cladding, it also helps to prevent water reaching the interior. We were pleased to see that a 10 year warranty is offered, but we feel that it could have been even longer for a shed of this quality. 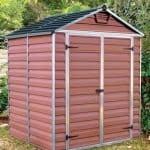 It’s easy to have the wrong impression about plastic sheds if you haven’t owned one previously. This model, for example, we found to be very pleasing on the eye. Despite having a characteristic ivory colour associated with PVC it still has a traditional look thanks to the apex roof and overlap style cladding. In essence, it’s a secure garden shed that combines the advantages of modern PVC with a traditional aesthetic appeal. We always like to see apex roofs on large sheds and workshops as this stops water ponding on the surface. As well as giving added weather protection it also creates extra vertical space, as shown by the ridge height of 2.16m and the eaves height of 1.85m. 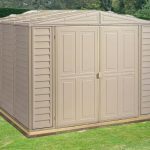 When choosing a site upon which to base this shed, you’ll need to consider the outer dimensions which are a width of 3.18m and a depth of 3.97m. We like PVC cladding for the ease of use it supplies, in that there is no requirement for the owner to do anything once it’s been installed. On this occasion, we also found it to be strong and relatively thick, although still lightweight. It’s based upon a strong steel frame, which gives reassuring stability even in windy conditions. 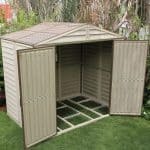 As with most plastic sheds we review, there is no floor included as standard, as it’s intended to be screwed onto a pre-existing base. 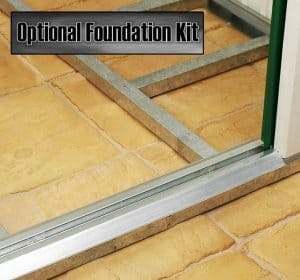 A level area of concrete is best for this purpose, although a patio or paved area will also suffice. We would have liked to see an anchor kit included as standard at this price, so it was a little disappointing to see that it’s listed as an optional extra. One other area in which this shed could have done slightly better is the warranty. PVC is very long lasting, and the overlap nature of the cladding is effective at keeping water away. For these reasons, we feel that a warranty period of more than 10 years could have been provided. Nevertheless, this does still provide peace of mind and, of course, there are no treatment requirements to go with it. The double hinged doors really stood out for us, as they make it very easy to get in and out of the shed with goods of any shape and size. Strong and sturdy in operation, they create an opening which is 1.52m wide and 1.80m high. Both of these dimensions are more generous than on most sheds we review, so there’s no need to worry about having to bend down when using the entrance. There are no windows on this shed, which is a useful design feature in itself, but we were pleased to see that a window can be added as an inexpensive extra if required. The lack of windows means that passers by will have no way of knowing if anything valuable is kept inside. 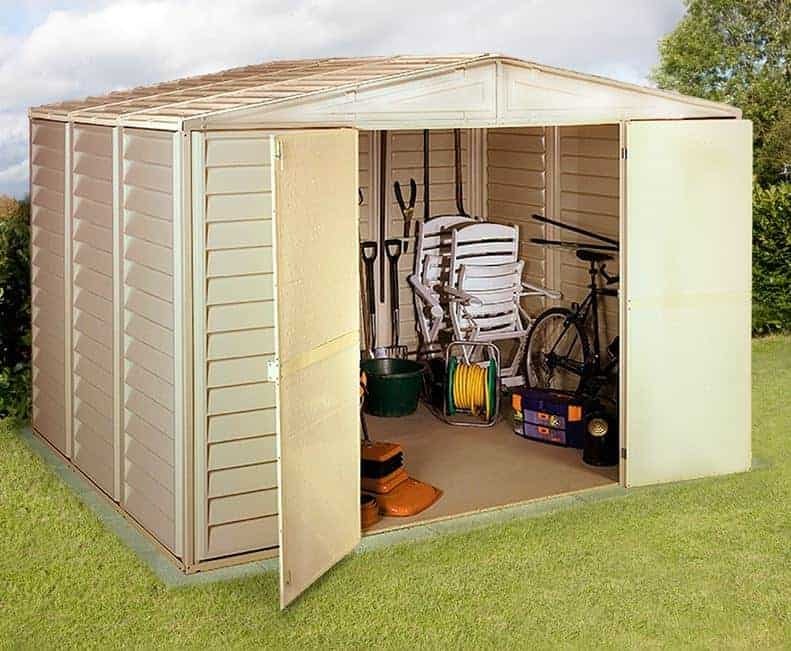 This can be particularly useful if the customer is storing valuable items such as a motorcycle within it, and for this reason it can make a good security shed. For it to be used for this purpose, however, a strong padlock would be needed, and we were disappointed to see that one wasn’t included as standard, although the handles are padlock ready. As mentioned above, whilst the standard shed is window free there is the option to add a 0.58m high window for just £70. It features acrylic glazing, which is tough and shatter resistant whilst still allowing a good quality of natural light to reach the interior. Some cutting will need to be done to fit the window to the cladding, but this isn’t a difficult task. If a level area of concrete already exists then a set of Hilti screws can be purchased to affix the shed. 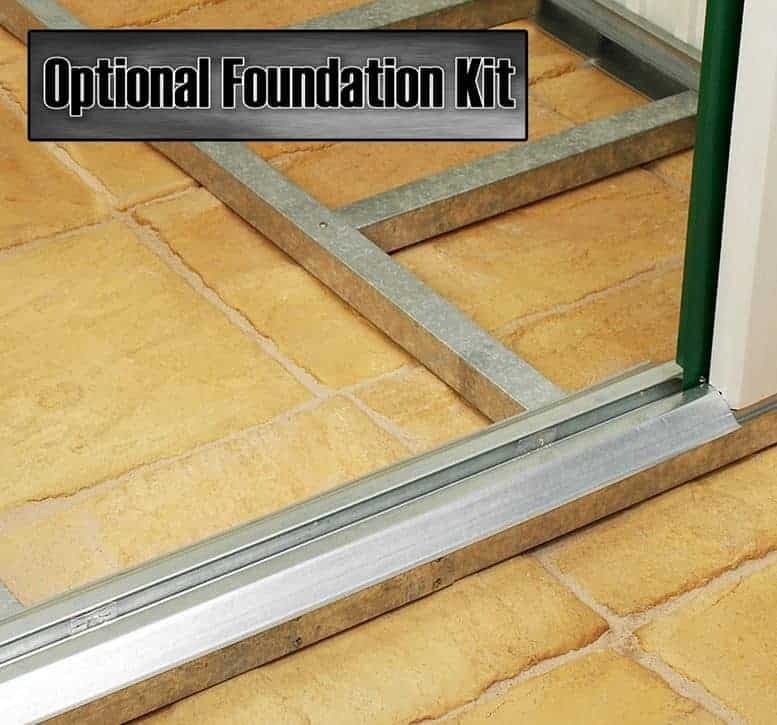 We feel that these should have been included as standard, but one extra that we do welcome is the optional foundation kit. This makes it easy for customers to construct a suitable concrete base for their new shed. It was clear to see that very high quality PVC had been used for the cladding, and everything fits together neatly and easily. PVC is the most durable shed material of them all in our opinion, and we were pleased that the steel frame within it was also thick and reliable. This is a very well sized shed, and because of the above average ridge and eaves heights as well there is also vertical storage capacity. The optional extra racking unit can help you make the most of this. The cladding is relatively easy to install when following the instructions, although due to its size fitting the roof can be a little time consuming. With a friend’s help you can expect to take around four hours on the installation. Whilst the price is over nine hundred pounds, the customer gets a lot of shed for their money and it’s sure to be long lasting as well. A longer warranty period would have added even more value. 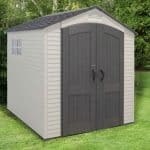 Final Thoughts: We feel it’s time that more people took a look at plastic sheds, and as long as this price tag is within your budget it’s an excellent place to start. This will fit in well with a garden that already has a PVC conservatory or next to a home with a PVC roofline, and we found it to be surprisingly elegant considering its large dimensions. You can fit a lot into this garden building, and because there are no windows, you won’t have to worry about shed thieves knowing what you’ve got inside. We would strongly recommend the purchase of a padlock and maybe even an alarm, but once that’s done this shed presents a secure and durable storage solution.